The debate tonight between Bill Nye and Ken Ham was won by Nye hands down. Hands up. That is a fantastic point. I have not seen it made before. 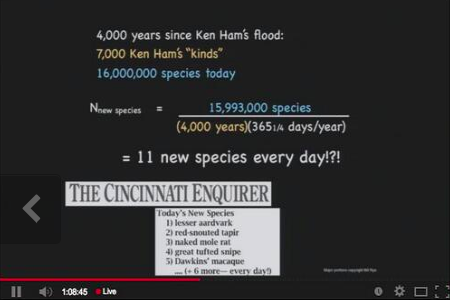 The point is that if there were only 7,000 "kinds" on Noah's Arc, then with the conservative estimate of 16 million species today, then an average of 11 new species should have evolved (even in Ham's creationist model) every day. There should have, in Bill Nye's words, a daily newspaper column listing the new species. Yet nothing like that has ever been observed. So that was one thing that made this whole debate really enjoyable or me. Antarctic ice-cores show that the first snow that fell and made the bottom layer of the ice is 680,000 years old. There are trees that are more than 9,000 years old. Grand Canyon is many millions of years old. These are all dated by different scientific methods, and directly contradict an Earth that would be only 6,000 years old. If fossils all died during the flood, then similar species should not necessarily be found in the same sedimentary layers, but should be mixed. If kangaroos walked from Mount Ararat to Australia (via a land-bridge for which there is no evidence), then there should be remains of dead kangaroos along the way, and yet there is not a trace. The Arc as described in the Bible is simply too large to function when made of wood. Ken Ham also said some things. The main point he made, which he made very many times, was that there is a difference between observational science and historical science. Historical science is not valid science, according to Ham, who said that if you weren't there, then you can never know. But since God was there, and because he wrote it down in the Bible, we can only know what happened by reading the Bible. This stance of course eliminates our ability to conduct criminal investigation, but no one would actually be that dumb. I have at least never heard of any creationist picketing crime scenes and courthouses when they obtain and allow historical evidence. I predicted that Bill Nye would win this debate. What I meant was in the long term. What matters is inviting young people and children to explore science, and showing them that there is another model than creationism that in fact most people in the world find more credible. That was the goal, also as stated by Bill Nye. However, I also think that Nye won in the short term. He clearly came away looking way better than Ken Ham, having presented his case with a confidence that I think most viewers noticed. He made great points that hopefully will make young creationists think twice and make them go look at the science for themselves (thank goodness for the internet) before they become hardened creationists heavily invested in creationism. The fear of some people, like Richard Dawkins and Jerry Coyne, was/is that debating at all lends credibility to the creationists: "Well now, if Bill Nye takes Ken Ham seriously enough to publicly debate him, then maybe there really is something to creationism", or "That Bill Nye shows up in the first place confirms my belief that Ham's creationism model is correct". I just really, really don't think this is the case anywhere. I'd love some data on this, and to change my mind the data should show that this effect is greater than the effect of getting children interested in (real) science. I think Nye did an excellent job, thank you very much.